It’s amazing where a bit of luck can land you. Over the last few days, I’ve found myself adrift without GPS on a sinuous bit of remote Japanese rural road, blitzing along in a Murcielago R-GT without ear protection, and the lone Westerner in a Mazda fan event numbering 1200 cars - and then Yojiro Terada broke out the 1991 LeMans-winning four-rotor 787B. It was, as they say, a trip. After interviewing Walter Wolf, 1970s F1 racing team owner and international man of mystery, I was contacted by the former owner of the first Wolf Countach and the current owner of the third car. They’re pretty interesting machines, one-off R&D test-beds for Lambo in the 1970s, and it was nice to know they survived. Long story short, Tomohiro invited me to drop by and check out his garage any time I happened to be in the Hiroshima area. He’d garnered some notoriety from driving his ex-LeMans XJ220 on the street, and had picked up a few more interesting machines as well. Pop over, he said, and we’ll go out for a drive. Putting things together took a little time, but as it happens Hiroshima is, of course, the headquarters for Mazda. They’d an event planned for the 50th anniversary of their Miyoshi proving grounds, and while it was nominally Japanese press only, I’d certainly be welcome. Next thing, I’m in an NA Miata, somewhere deep in the hillsides around Hiroshima, staring at a dead iPhone. Oops. But talk about your happy accidents. I spent the bulk of the day at play on roads that looked like the below in a car formerly belonging to the first Miata’s project manager. This car is part California, part UK, but it’s also deeply connected to these roads, and the pairing is amazing. 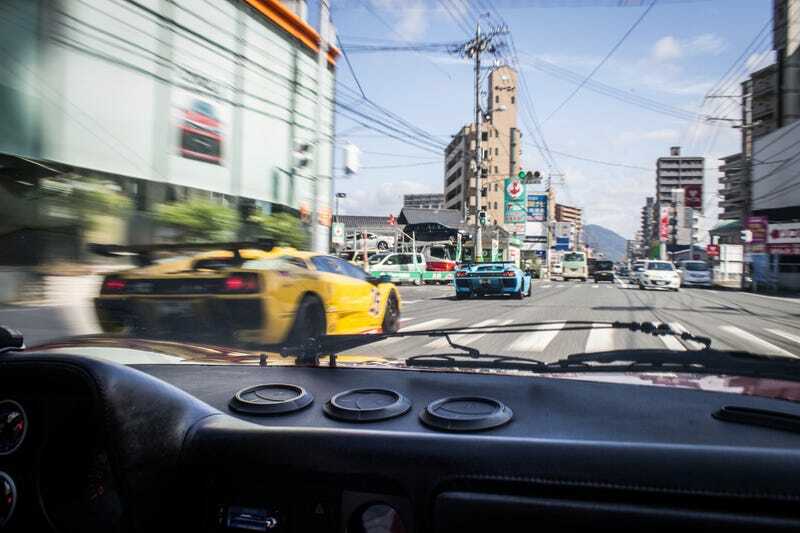 The next day, Tomohiro showed up in a twin-turbocharged Ferrari 512BB and we went to collect a pair of Diablo SV-Rs for a highway run. It was loud, hot, and a lot more comfortable than the next ride. The BB is a long-time machine of Tomohiro’s, a 35 year build with Koenig bodywork and a mix of Euro and Japanese tuning. It hauls, and was fairly easily capable of keeping ahead of the twin racing Diablos. We left them to continue North and headed over to his garage to dig out something else to take for a spin. Plenty to choose from: the prototype Gumpert Apollo, a 1000whp JUN-tuned 300ZXTT, a Motegi-fettled 996 Turbo - and the most recent addition to the collection. All get street-driven, and this thing’s probably the most nuts. Rear-drive, carbon-fibre-everything, sequential gearbox, zero concessions to comfort. Considerably lighter than a standard Murci’, the R-GT ran unclassified at the 2008 LeMans, and has a few shorter endurance racing campaigns under its belt. It’s one-of-nine. I kept hitting my head on the tight roll-cage. We went fast. Er, allegedly. The day after that was the Miyoshi anniversary, a further deep-dip into both Japanese car culture, and Mazda fandom in particular. About 2000 people attended, and if there was a rare Mazda you wanted to see, it was there. Curiously, Mazda didn’t pull much out of their Museum, but instead just called on local fans to show up in their personal cars. To cap things off, LeMans driver Yoijiro Terada hopped into the winning 1991 787B and punctured everyone’s eardrums with a couple of flying laps. You really have to hear a four-rotor at speed once in your life - try Monterey, or maybe Sevenstock - as the ringing will last you a lifetime. Just wonderful. I’ll have to come back, of course. There are still corners left to poke around, a supercar show I missed before, a few more of Tomohiro’s friends to meet, a few more epic rides tucked away in garages. There’s about a hundred more pics and fuller accounts in the embedded links. Until next time Japan, sayonara. U WOT M8? Driving the Sierra RS Cosworth.